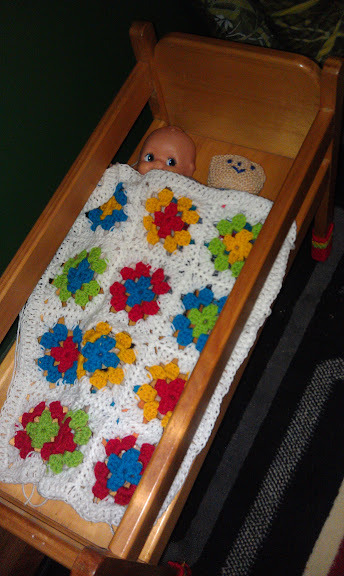 I bought a dolls cot from the op shop last week for a whopping $9, and it matches the furniture in my son’s bedroom perfectly. So I had no choice really but to make a little blanket that matched his crochet blanket – which I don’t think I ever wrote about finishing! It’s just 3 x 4 granny squares with 3 rounds for each square, and then edged with a simple treble crochet stitch. Only took about a week of evenings to do, and it really helped that I knew it was only going to be small!